A Community Built by Bread — Wayward Roots & Co. When we hear the expression “breaking bread” it often evokes the understanding that a shared meal is a symbol of kinship. It is an act that represents respect and trust and can even embody the notion of forgiveness, a token of peace. The expression’s roots descend from biblical origins, yet it has sustained its relevance throughout the evolution of human society. It has come to be viewed as sacred, placing bread at the heart of our world’s cuisine, coveted for its omnipresent source of sustenance and nutrition. This stature has shaped the sharing of bread to be an act of significance, an act that transcends our many human discrepancies and offers compassion and camaraderie. In more recent times this beloved substance has become the culprit of its own demise. With dying wheat varieties being pushed out by industrial agriculture in favor of ideal structured, high-yield counterparts, questionable practices have been allowed to take root such as over-processing for the sake of uniformity. The result of these practices is a rising intolerance towards proteins common within the glutenous savior and ultimately a rejection of the esteemed loaf for the first time in modern history. In contrast, it is this awareness that has inspired a surge of individuals taking matters into their own hands. We are seeing the resurrection of heirloom wheat varieties from farmers, chefs, and bakers seeking to offer a breadth of flavor and complexity that exists within what has become commonly thought of as a simple, bland grain. There are others heeding their call to provide traditional stone mills specialized in processing these lesser known breeds. In some ways, this movement can be seen as a rebellion against the industrialization of our current food system. It can also be said that the individuals driving this shift are acting from a place of compassion. These are people who are working to revive the beauty and complexity which has been lost from both the assortment of crop varieties that are grown to the manner in which they are handled and processed. It is these people who are offering a different way of engaging with our food, carrying with it the hopes of a new beginning. It is this type of care and love for food — or more specifically bread — that brought me driving down the highway on a freezing February morning toward an area of Montana known as Four Corners. Located just outside the city of Bozeman, it is a community aptly named for being a crossroads along the way to somewhere else. It is developed, quite literally, on all four corners of the main intersection, offering an array of gas stations, casinos, gift shops, small eateries and coffee drive ups. And of course, no Montana interchange is complete without the presence of a well established local watering hole. My instructions led me beyond the bustling junction into a small neighborhood tucked back from the byway. As I pull into the drive, I see a door off the side of the garage adorned with a sign reading “fresh bread pickup”. I know I’m in the right place. Stella pops out of the side door, beckoning me in out of the cold and welcoming me into the warmth of her workspace. The converted garage has become the headquarters and production space for Stella Bakery. It is meticulously clean, just as you would expect from any commercial kitchen, adorned with restaurant grade refrigerators, work surfaces, wire shelving displaying a collection of bowls, baskets, aprons, seeds, and well toasted oven mitts. In the corner is a pallet of flour bags from assorted producers, and the pinnacle attraction of the space, a workhorse of an oven. It is Stella’s proudest, most recent upgrade to her production process allowing her to bake more loaves at once, reducing her time on baking days. The air is pungent with the scent of freshly milled grains and rising yeast. It’s earthly and warming, igniting the senses in a blanket of nostalgia and comfort. It is a smell that feels deeply familiar, perhaps ingrained in our biology from the daily preparation of loaves throughout the ages. It is a sensation rarely experienced in our modern lives. If I could give you one task right now it would be to go find your local bakery in the morning. Do yourself a favor and order whatever loaf is fresh and slather it in butter or olive oil. Or just walk inside and let your senses marinate in the aroma of the earth soaked in rain and sun being transformed into the sustenance of life. Yes, stop and smell the roses, but rising dough or freshly baked bread will do just as well. The bakery is located beneath Stella’s home where she lives with her husband and baby boy outside of Bozeman, Montana where they relocated from the Eastern Sierras of California in 2015. It is this rugged desert-meets-mountainous area near Mono Lake where the birth of Stella’s bread journey truly began. Once again her gut was on point. She found herself much better matched for bread. Everything about the process from mixing and shaping, to the smell and intuition opposed the rigidity and exactitude of pastry. It felt right. Even her hands were happy. Bread not only allowed her to be more creative and operate through intuition, but was further motivated by the fact that it was dietarily nutritious. 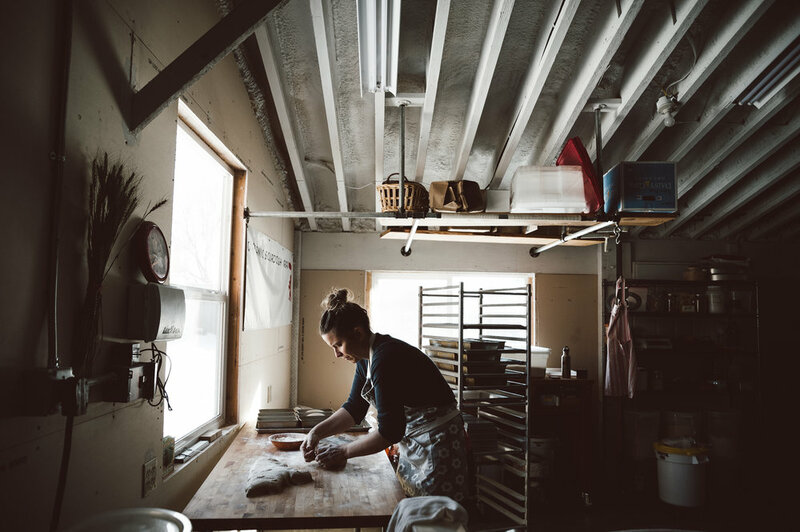 So, in the 400 square foot cabin she shared with her husband, the beginnings of Stella Bakery commenced. In an effort to navigate this career shift and have all the necessary ingredients viable, the idea struck to create a model structured like a farm CSA (Community Supported Agriculture). But in this case it would be a Community Supported Bakery, “I sent out an email to all my friends and people I knew through the bird-world and offered them three share options: bread, pastry/dessert and cake. They could pick one or all three but had to commit for 8 weeks. And people signed up! I filled my 12 spots for the first ever CSB. And just those twelve shares filled our house.” To distribute the shares (and save space in their small home) she converted an old toolbox into a pick-up box to be located outside of their house. This allowed her customers to come by the house once a week to collect their shares at their own convenience. Now, standing in the baking space of this newly found home in Four Corners, Stella begins pulling out batches of starters, mixing them with the seeds and grains that will compose the various loaves. Mixing by hand, the push and pull of her kneading movements bring the doughs to the desired consistency before they are then set aside to rise slightly. Many bakeries no longer mix their bread by hand. This decision is partly due to the scale of dough being handled, and partly for the sake of convenience and time. Though hand mixing is an element of Stella’s process she has been resistant to giving up. She has acquired a large scale standing mixer — this baby stands at nearly hip-height, ready to take on those larger batches — but she hadn’t quite adjusted to frequent use of the machine yet. She trusts her hands and how they know when the consistency is just right, mixing evenly to her desired consistency. Beyond Stella being a small local bakery making fabulous bread, another element that brought me to standing in her home-bakery on this chilly morning was also the process and ingredients she incorporates into her baking. Inspired by her German childhood, a traditional European style of bread was what she set out to achieve. In those days, she tells me, many of the bakeries were still small neighborhood storefronts producing bread she considers a more traditional — or pre-industrialization — style bread. They were using their own starters. Wild-yeast and sourdough starts create a world of possibilities in the end flavor result. It acts as a personalized signature for each bakery woven into the loaves. They also incorporated an array of seeds and grains to create more complex, yet common, everyday breads. There is also the fermentation process. Not just the activation of the starter itself, but of the wheat upon combination with the yeast. And she’s not talking about the 60-90 minute rise on the counter top. Stella practices what is known as a cold fermentation. After the initial bulk rising, the bread is shaped into loaves where they are then placed in the refrigerator for a minimum of 24 hours. The cooler temperatures slow the rate at which the yeast consumes the sugars of the wheat and in-turn the rate at which carbon dioxide is released, leavening the bread. The slower pace of this fermentation process also contributes to more complex flavors in the loaves, allowing time for more microbial reactions to take place. This is also the stage when the gluten and phytic acid begins breaking down — a key process in making grains more nutrient available and digestible for humans. She believes it is this differentiation that has had her gaining customers who were no longer eating bread or had experienced gluten sensitivities and intolerances in the past. Back in the bakery, Stella steps away into the house to check in with her husband and son. When she returns she is carrying a small jar. It’s her starter. Though it has been “fed” over the years, never shrinking below a half cup, it remains the same root base of the starter her friend had gifted her all those years ago. Even at that time, the starter had previously been a gift to her friend, descending from another fellow sourdough baker. She tells me about attempting to start her own cultures in the past but has found that the older the starter, the more stable and rich the yeast seems to be. 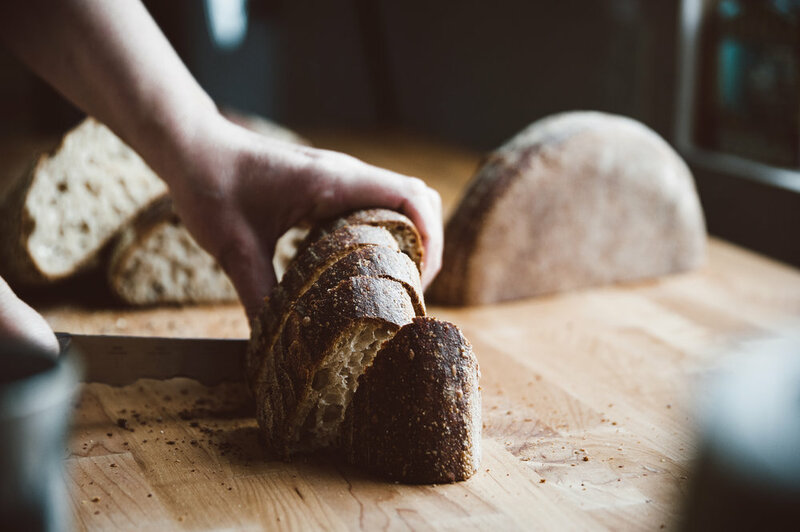 While the true effect of an aged starter vs. a young starter is widely debated, you will be hard pressed to meet a baker with an aged starter that is not convinced it impacts the overall flavor of their loaves. I ask her if she has a name for her starter. Yes, this sounds like a ridiculous thing to ask, but it would not be the first time I’ve heard of someone naming their yeast culture. She laughs, saying that she tried coming up with a name for a time but nothing ever stuck. Regardless, this little jar holds an integral piece of life for Stella’s bread. Once the dough mixes have risen slightly, she lays it out on her work surface to begin the shaping process. Using a pastry cutter and scale, she cuts away loaf size portions, measuring by sight. Then weighing the small portion to double check her guesstimate. Then begins the shaping. She pulls the edges of the dough over itself, her hands moving quickly yet delicately as she makes the folds. She tells me she folds the bread no more than 4 to 6 times, an act that preserves the moisture and texture of the loaf’s finished consistency. Once the shaping is completed, the small bundle of dough is then quickly transported to a sheet or loaf pan. While her production process stands apart from many conventional or commercial bakeries, there is also the added element of her European inspired flavors. While she produces a much loved Country Sourdough, her spread also includes loaves such as German Rye Sourdough containing coriander, caraway, and fennel seeds; a Sunflower Seed Sourdough; Vollkornbrot (Sprouted Rye) containing sprouted rye berries, sunflower, flax, and sesame seeds; and a Kamut Wheat Sourdough with cracked kamut; and one of my personal favorites, a Polenta Sourdough Bread which contains a bit of polenta within the mix, followed by swiftly rolling the shaped loaf in dry polenta before baking. This added exterior coating adds a beautiful toasted flavor and surprising crunch to the crust of the loaf. As she only offers a small portion of her bread variations at a time, availability of types rotates seasonally by customer demand or availability of ingredients, making her specialty breads all the more coveted by her loyal customers. She would drive up to Northern Montana to visit farms, explaining that she needed just a few hundred pounds of their wheat or grains only to be told that they did not have the ability to clean and process in smaller quantities for the end consumer. Not only are many commodity farmers unequipped to provide grains directly to the average consumer, much of what is grown in the state of Montana is done so at the expense of exportation. Meaning that the majority of wheat [for example] grown within the state is never used or tasted by its own residents. However, there are a select few small-scale mills attempting to get Montana wheat into the hands of the state’s bakers, but that is a story for another day. Over time, Stella has managed to single out sources for her bread ingredients within the state, or at the very least as close as Utah. Discouraged, she admits there are some ingredients, such as specific seeds, that she has been unable to acquire locally but tries to find the most sustainable alternative possible. Of the partnerships she has formed, she raves about Casey Bailey of Clearlake Organic Farms who provides the Hard Red Winter Wheat she uses. Located in Central Northern Montana, Bailey has been making a name for himself as a grain farmer through his own production practices and sustainable agricultural philosophy. Bob Quinn of Kamut International has been another source [for her Kamut Wheat Sourdough], and has been an influential individual as she has sought out farms to work with. She removed bins from the wire shelving containing unmilled wheat and barley. Scooping them up with her hands, she shifts them around between her fingers, feeling their texture. She holds them out for me to examine and smell. I inhale the scent of sundrenched earth and marvel at their range of colors as she tells me the farms that each of them are from. She glows with not only pride of her grains, but joy and love. It soaks into me while in her presence. While preparing the loaves for the oven, she lays stencils over each of them, then dusts them with a flour sifter. The stencil leaves a perfect floury outline. The loaves receive different stencils depending on which type they are. Some are adorned with a bear that can be seen on her logo. Others receive a triangle with a bison in the center, a symbol designed in support of the Standing Rock protest. Using her bread as a small political platform, this past fall during election season she garnished loaves with the word “Vote”. The garnish provides a decorative trademark of sorts, but also brings about questions from customers and bystanders. It invites them to safely join in conversations that are, in today's world, often avoided in face-to-face interactions. 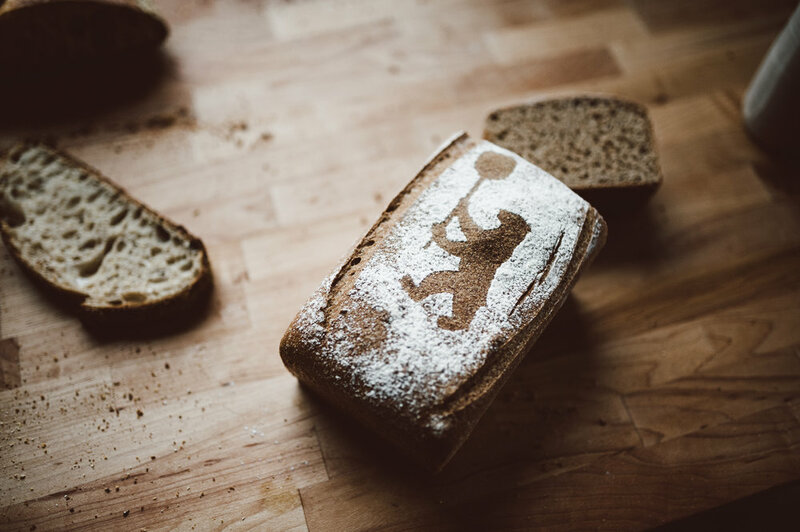 A simple flour etching over a loaf of bread extended a welcoming hand toward a neighborly exchange. Bread, once again, bringing people of her community together. As she has settled into Montana over the past few years, her baking repertoire has been refined, no longer offering the cakes and desserts she once provided to her CSB customers in Lee Vining. The transition allowed her to focus on strengthening her bread skills and was what stirred her true passion. This transition was also met with the arrival of her son, Finley. With time and resources becoming more precious, she also had to let go of the CSB program. However, when I asked her what she sees for the future of her bakery, aside from more local ingredient resources, she wants to bring back the CSB. But for now, she will continue to refine her technique and experiment with new bread varieties while making her rounds through the region’s farmers markets. Though they can be taxing, she loves attending the markets where she can interact with and receive feedback from her customers or visit with her regulars and neighboring merchants. Because in the end, that’s really it’s all about for her- the people. Or better yet, the community. Once the final loaves have been removed from the oven and transferred to the cooling rack, Stella pulls an array of cooled loaves and brings them over to the butcher block. Cutting into them, she turns the center towards me, exposing the delicately formed air pockets spattered throughout the loaf. Between sips of tea, we cut away slices of the various loafs, dipping them in a silky, yet, mildly salty olive oil. It is an explosion of flavor and warmth that reaches to my soul. These seemingly simple ingredients — bread, oil, tea — have long been foundational elements of our worlds cuisine, though are routinely taken for granted. They have been dismissed as basic or bland when prepared with poor quality, even chastised for perceived unhealthful qualities. But to sit in this space with a bread of this caliber, having been created with the utmost care alongside the hands of its creator — it makes the experience all the more enriching. After we exchange our farewells, I step out into the cold February air once again, my arms piled high with bread. Edible mementos that I will cherish, sharing with others whom I plan to visit that day. I begin my drive back towards the bustling junction feeling full, yet lightened from the experience with bread that was shared on that day. And I can’t help but think, what could be better?